Warming temperatures are fueling the expansion of pine and spruce beetle outbreaks across North America, Europe, and Siberia, ravaging tens of thousands of square miles of woodlands. Scientists warn that some forest ecosystems may never recover. First, mountain pine beetles devastated lodgepole and ponderosa pine trees across western North America. Then came spruce beetles, which have targeted high-elevation Engelmann spruce, spreading from New Mexico into Colorado and beyond. 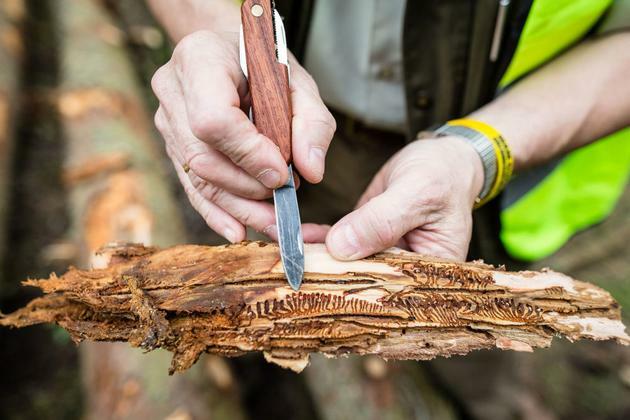 Altogether, with their advance fueled by climate change, bark beetles have ravaged 85,000 square miles of forest in the western United States — an area the size of Utah — since 2000. Pine beetles also have killed trees across roughly 65,000 square miles of forest in British Columbia, and in the southeastern U.S., they have caused millions of dollars of damage to the timber industry in states such as Alabama and Mississippi. And from Europe to Siberia, bark beetle outbreaks are erupting with increasing frequency in woodlands weakened by rising heat and drought. Switzerland is preparing for the eventual loss of spruce, its most important tree, as warmer weather fans conditions that will make it nearly impossible for all but those high in the Alps to survive. The Czech Republic, Poland, Germany, and Slovakia are all experiencing intense beetle attacks on their Norway spruce. In Siberia, a related spruce beetle has helped another insect pest, the Siberian silk moth, damage more than 1,100 square miles of Siberian fir, pine, and spruce since 2014. That infestation is now spreading northward into historically outbreak-free boreal taiga stands. “The amount of conifer mortality that we’re seeing both here and in Europe is unprecedented historically,” says one U.S. expert. Bark beetles are a natural part of the conifer forest life cycle, regularly flaring and fading like fireworks. But the scope and intensity in the past two decades is anything but normal, scientists say, in large part because rising temperatures are preventing the widespread winter die-off of beetle larvae, while also enhancing the beetles’ killing power. Not only are the insects expanding into new territory, they’re also hatching earlier and reproducing more frequently. New infestations become full-blown with astonishing speed, and the sheer numbers of beetles exceeds anything forest experts have seen before. Morris says he’s seen spruce beetle epidemics in Utah so intense that when the insects had killed all the trees, they began attacking telephone poles. The spruce beetle (Ips Typographus) has expanded its range across Europe and Siberia. Perhaps even more concerning is that beetles are beginning to target novel species, such as the jack pine — found across wide swaths of Canada — that had escaped assault until now. Take the southern pine beetle, which until recently was restricted to its native habitat in Central America and the southeastern U.S., because its larvae die when cold winter nights drop bark temperatures below 14 degrees F. The latitude of that lethal chilling limit has been creeping northward by about 40 miles a decade since 1980, the new study by Columbia University researchers finds. At the rate they’re progressing, southern pine beetles could damage nearly 273,000 square miles of northern red and jack pine forests by 2080, says Corey Lesk, a Columbia University graduate student who has modeled the insects’ advance. Normally, infestations last for a few years until the beetles kill all their host trees or a cold spell kills the beetles. After that, the pine seeds that fell to the ground germinate, and the forest gradually regrows. Beetles won’t attack young trees until they reach around 3 inches in diameter. But today’s changing climate is stressing trees and making them more vulnerable to invading beetles at the same that it’s making the beetles more potent. On top of that, in the U.S., decades of fire suppression have left forests unnaturally dense and uniform, facilitating the beetles’ spread from tree to tree. Increasingly long and intense droughts in recent years have weakened the defenses of trees. The world’s conifer forests have survived bark beetle attacks for thousands of years, thanks to the trees’ effective defense mechanism. 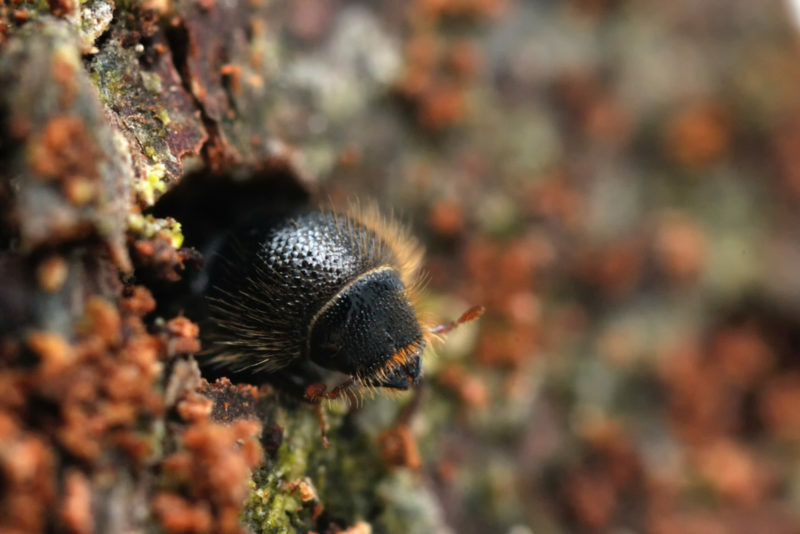 When beetles burrow into their bark, trees release a sap rich with volatile toxic chemicals to flush the insects and prevent them from sending pheromone signals mustering other beetles. But increasingly long and intense droughts of recent years have weakened the trees’ defenses. Without sufficient water, trees can’t produce enough sap. Hot temperatures cause further moisture loss. Trees weaken and become easier to overwhelm. The ecological impacts of beetle mega-outbreaks aren’t clear-cut. But there’s a potential for some devastating consequences. One of the top concerns following severe outbreaks is wildfire. Fires have whipped through some beetle-kill areas with incredible intensity, such as the West Fork Complex fire that burned more than 100,000 acres in Colorado in 2013. Standing dead trees also make it much more difficult and dangerous to fight forest fires, because of the risk that these skeletons will fall. The relationship between wildfire and bark beetles is complicated, Fettig and other scientists say. The severity of a blaze depends on the timing and intensity of the beetle infestation. Fire risk is highest in the first few years, when the needles are still on the dead trees. After the needles drop, it’s more difficult for fire to move from tree to tree, a phenomenon called “torching.” However, when new growth sprouts, the fire risk could rise again. And in hot, dry conditions, essentially any forest can burn. Another major toll is on the forest food web and wildlife habitats. Conifer seeds are a key source of food for numerous species of birds and animals. For instance, the whitebark pine, with its especially large and nutritious seeds, is a favorite meal for grizzly bears fattening up before hibernation. Beetle outbreaks around Yellowstone National Park in recent years have wiped out more than a million acres of whitebark stands, forcing the bears to move to lower elevations — and closer to humans — in search of food. Concerns about the decline of whitebark pine were a key reason Yellowstone grizzlies were on the endangered species list until this summer, when Secretary of the Interior Ryan Zinke lifted the bears’ protection. With the beetles now moving into tree species that haven’t been attacked in the past and lack natural defenses, the potential for wildlife consequences has magnified. Scientists are especially concerned that southern and western pine beetles are making the jump into jack pines — which span parts of the northern U.S., as well as Canada from coast to coast — and could give the beetles a “land bridge” across the continent. That could potentially usher outbreaks through important bird breeding ranges and key wildlife food supplies as far north as the Canadian tundra. “People now are really worried that this beetle is going to devastate the boreal forest,” says one scientist. “People now are really worried that this beetle is going to devastate the boreal forest, which is a really critical forest for wildlife, carbon sequestration, and so forth,” says Six. Already endangered species native to the jack pine forests, such as the Kirtland’s warbler, could be pushed over the edge. The rare songbird only nests in a specific area of the Michigan jack pine forest, which could lie directly in the beetles’ future path. “It’s a good question whether they, or any conifer-nesting bird, can outpace the spread of the beetles once they get going,” says bird field guide author Kenn Kaufman. Beetle epidemics may also threaten water resources. In forested mountain watersheds such as in the Colorado River Basin, which is the main source of water for Western states, the bulk of the annual precipitation falls as snow. Without sheltering tree cover, the snowpack could melt earlier, sending much of it down the river weeks before the peak agricultural demands of summer. Researchers have yet to detect major impacts on water resources from U.S. bark beetle outbreaks. But as beetles reach spruce trees at higher elevations, where more snowpack is stored, things could change. “If we think about the Western forest being the water tower of the West, the spruce-fir zone is really the bulk of that water tower,” says Jeff Lukas, a climate researcher with the Western Water Assessment. 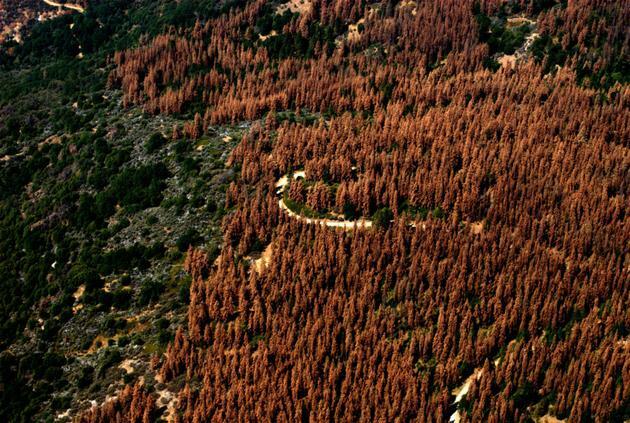 Scientists say that the loss of large swaths of conifers could also turn forests from carbon sinks into carbon sources as infested stands of pine, spruce, and fir stop absorbing CO2, die, and rot, releasing stored carbon. The beetle outbreak picture is somewhat different in Europe, where infestations tend to be managed much more closely than in the U.S., in large part because European nations have far smaller areas of forest to monitor. In Germany, for example, government foresters inspect each conifer stand in their district every two weeks for signs of beetles, according to Horst Delb, head of forest health for the FVA Forest Research Institute in Freiburg, Germany, which focuses on the renowned Black Forest. “We know every tree personally,” says Delb. When an infected tree is found, it is removed right away, before the brood can hatch and infect more trees. “So we don’t have these huge areas of damaged trees,” he says. The vast public woodlands of the U.S. are mainly monitored by aerial surveys, which are conducted far less frequently. Beetle management options include forest thinning before an infestation takes hold, logging afterward, or leaving tree skeletons undisturbed. What does the future hold for the world’s conifers in the face of the bark beetle onslaught? Most forests will recover to at least some degree, scientists say. Generally, conifer forests are resilient, and they eventually return following a beetle epidemic. But with the scale of devastation today, many forests may never return to their former glory. And climate change could turn current forest knowledge on its head. “We’re moving into a pretty big era of uncertainty,” says Six. Some forests already appear to be losing resilience. In parts of California’s southern Sierra Nevada, beetles have killed nearly every low-elevation ponderosa pine. Scientists say those trees may not come back as droughts kill seedlings and changing climatic conditions drive the ecosystem beyond a tipping point. “I do think we’ll see some conifer forests transition to oak woodlands,” says Fettig. “Some will transition to shrublands or grasslands.” Large pines and spruce may give way to smaller, scrubbier fir.